The beauty of working with precious metal clay is that you can do it almost anywhere! I started out in our small sunroom on a small table. 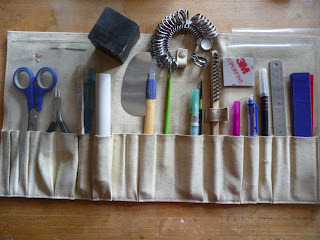 I have to admit, the number of tools I had available right after I became a certified instructor for Art Clay Silver, was rather small. Everything fitted into the tool bag, see photo, and was put away quickly. Nowadays it is a bit different, my workspace has somewhat expanded: my youngest son's bedroom has been transformed for my artwork. The boxes with stamps and items I use to work with the silver clay are right there at my fingertips, and are easily packed when I take them with me when I teach out of the house. The latest addition to my set up was a camp stove, (well before the earthquake in Christchurch!). Not for cooking but to show my students how easy it is to fire on it the jewellery they made. 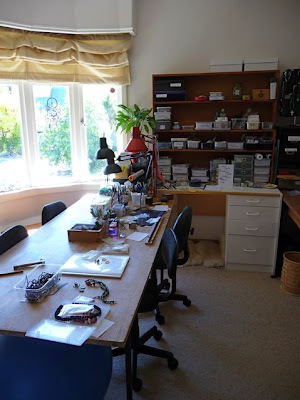 I enjoy my jewellery studio, best thing is that I don't have to move work in progress any more! I wish I lived close enough to take a workshop from Ingrid. Her work is gorgeous.